sh44 wrote: I have a question. Sorry if it's already been answered. In the FOIA Narrative from Tom's website on page 5 of the document, it states "While at the Juniper Flats backcountry board parking area, several volunteer search and rescue team members said they saw lights in the saddle of the closest ridge. The ridge was not visible when they pointed it out to me." Any idea what this light was and where it would be/if this was checked out further? The narrative stated on the next page that the ridgeline where the lights were seen was searched, and nothing found. According to the coordinates of the towel, and what are considered the more accurate bandana coordinates, the two locations are less than 200ft apart. Perhaps a local hiker or hiking group has been tying a waypoint marker (bad LNT) to mark their favorite route up Quail. Those locations are on a fairly obvious up the face of Quail. If I remember right, there's a well defined use trail from the end of the road in the center of Juniper Flats to the toe of this slope, then people do their own thing. Some stay on the ridge to the right and others use the canyon to the left. I've done both. It's a nice little canyon but after it curves to the left you're forced up and out of it. As I said, that bandanna location never made any sense as a marked decision point for the return as the route's real obvious, not to mention Juniper Flat is laid out in plain view beneath. OtherHand wrote: Those locations are on a fairly obvious up the face of Quail. If I remember right, there's a well defined use trail from the end of the road in the center of Juniper Flats to the toe of this slope, then people do their own thing. Some stay on the ridge to the right and others use the canyon to the left. I've done both. It's a nice little canyon but after it curves to the left you're forced up and out of it. As I said, that bandanna location never made any sense as a marked decision point for the return as the route's real obvious, not to mention Juniper Flat is laid out in plain view beneath. Thinking this over, Tom, I see one or two contradictions in all of this. If the location of the bandana as a marker is senseless as Juniper Flats and the return route is obvious from up on top, then it does infer that the bandana was simply dropped accidentally by someone, perhaps even Bill himself. However, I can’t imagine Bill not noticing his bandana falling off his head whilst ascending a south-facing slope on or around midday at those temperatures with the sun falling on the back of his thinning hair. Ergo, it infers the bandana was dropped by someone else, or it was a spare that fell out of Bill’s pocket. One of those things, a red herring as supposed markers go. The only loose end on the above is that if Bill or anyone else *had* intended to use the bandana as a return route marker then he wouldn’t have known that it would be redundant until much later when he was indeed returning. Hindsight, and all that. Fast forward eight years and someone recently tied a towel to a tree within eyesight of the bandana location. Seems to me it’s obvious that it was intended to be a marker for the return route from up on top so you can pick up the top of that well defined use trail. Or am I as crazy as my wife says I am? And there’s the contradiction, if the towel’s a return marker then it adds credence that the bandana was also someone’s return marker. Someone could have found the towel and tied it to a bush so it would not blow away. They thought: Perhaps the owner is higher up on the mountain and will see it on their return. I have attached plenty of found items like hats, shirts, and bandannas to a handy bush or tree in my years of hiking. The idea is that whoever it belongs to will see it coming back. I was down in Joshua Tree this past weekend for vacation and convinced my wife to join me on a search. Everyone has an idea/theory on how Bill disappeared which makes this mystery interesting. I personally do not believe he ever made it to the top of Quail Mountain. Two possible scenarios are; He got halfway up Quail Mountain, was tired and out of water and turned back down. On the way down he missed the left turn on the route he came in on and ending up down somewhere in the Stubbe Springs area. Scenario 2 is he walked the 4 miles from the trail head and saw the Stubbe Springs trail. Being so hot and he was already low on water, he decided to go to Stubbe Springs instead of hiking up Quail Mountain which he most likely planned. In both examples he is in Stubbe Springs in which he had not planned on being there. This means he would not have studied the map for that area. Now Bill is lost, tired, and out of water. Trails and washes all look the same and it is extremely easy to get lost. No good decisions happen at this point and he continues to wander along different washes until nightfall. This area has no cell service. Bill spends the night in this area. Friday morning Bill would have woken up dehydrated and weak. He slowly hikes around having to stop and rest in whatever shade he can find. By the end of the day he is somewhere near the top of Lower Covington. Saturday is the same, but he is moving even slower with little ground gained during the day. He is only able to make it to the Covington Spring area or just beyond it. This is right at around the 10.6 ping area. The hills separating Lower and Upper Covington have a lot of ground cover and trees for shade. You can see this just by looking at a satellite view map. You can also not see Lower Covington road from here. Bill wakes up Sunday morning with barely enough strength to stand up. He climbs to the nearest rock pile to try his cell phone one last time. He turns it on, it just pings the Serin tower, and then the cell phone dies. Bill stumbles back down to his shady rest spot off the trail and closes his eyes for the last time. A ranger would have come to the Covington trailheads Sunday morning and Bill would have been only a half mile away. By the time people were searching for him on foot in this area he wold have already been gone. Tom's website lays out all the searched areas very nicely. Since I believe the above scenario I felt it was necessary to explore the hill above Covington Spring. This area had not been searched and fell within 11.2 miles of the ping. This allows the 10% variance. There were plenty of nice soft patches of dirt under trees where someone wanting to escape the sun could rest in this area. On the south side on the top of the hill I was able to get 3 bars of coverage on my verizon iphone. I was getting at least a bar of coverage almost halfway down the hill. In looking over maps I had played with drawing straight lines from the Serin tower to the Covington Spring area. Sometimes the line would pass directly through the FM Yucca Valley tower which is located on a hill before Nolina Cove. While out hiking above Covington Spring, anytime I could see the FM tower I would get a bar or more of reception. It was basically working as a visual clue for me on potential service. We did not find much other than 5 or 6 deflated balloons and a softball size coconut which was broken in half. I still believe Bill will be found 20-40 yards off one of the main trails in the Lower Covington area. 1. On his first night he worked his way off trail to a sandy depression to sleep. 3. 3rd morning he was so weak he could only walk 1 mile before finding shade and staying put. I know this is just another long post and theory. I do believe the more people talk about the Bill situation the more chances it can open a new door. MNZ3 - Thank you for your search. The problem with Bill going to Stubbe Springs is that another hiker named Greg Mendoza went there on the same day that Bill started. If Bill went to Stubbe Springs, why didn't Mendoza see him? RichardK - Stubbe Springs is a loop hike. Mendoza set off early and would have been ahead of Bill. Once Mendoza was actually at Stubbe Spring Bill would have been on the trail. When Mendoza came out of the loop on the southern wash Bill would have already been more North than him and they would not have seen each other. I ride my mountain bike on a few loop trails where the parking lot will be crowded and I only see 4 or 5 bikers the whole time. I realize from the Juniper Flats trail head to Stubbe Springs is the same trail, but it is very likely they would have missed each other. If Bill is found someday inside the park, I think there will still be questions that may never be answered. There's a lot of maybe's and maybe not's, probably's and probably not's. Very few absolutes. As anybody following this thread could probably guess, I'm inclined to believe that something deliberate happened. However, I'm open to being proven wrong and think it's still worth searching possible areas that have not been thoroughly searched yet. Maybe I'll search before it gets too hot. Looking closely, there's very faint cell phone coverage to the west of that peak, perhaps enough to ping a phone and then make the battery die. I think it's possible the ping radius error could be more like 20%, especially considering the pings in the Orbeso/Nguyen case. I found the Orbeso/Nguyen ping rather interesting, because we got the same rough location for that than we got for Bill's ping, and in that case, the location was obviously not correct. But the _distance_ in these pings has to be restrained by real world physics at some point, so I think that might be a bit more trustworthy. I think that Bill would likely be found in the Park, and I think he's either someplace odd that haven't been looked at yet ( I have my own crackpot theories there I need to find the time to pursue ) or he really is in the Smith Water Canyon area, which as others have noted is very rugged and full of nooks and crannies. But as far as the latter goes, I'm still recovering from an ankle and knee injury and while I feel great walking on fairly flat terrain and churned out 10+ miles in JT a couple weeks ago, I would not take my recovering shank into the Smith Water Canyon terrain just yet. So look towards fall for me to contribute to this search again. MNZ3 - I have done a similar search of the easterly slopes of the hill just southwesterly of the Lower Covington trailhead, down to about level with Smith Water Canyon's mouth ( so around Peak 5354 ). I think those slopes were relatively open and the Lower Covington area is easily visible from there, so it seemed like a very unlikely place. And I never walk in Joshua Tree but that I walk out carrying 2-4 dead mylar balloons. Nasty things. My record for picking those up was a baker's dozen packed out walking a 9 mile loop down in the Pinto Basin vicinity. The dry river bed/path that I followed after I had descended down from just west of Quail area had a lot of class 2 boulder hopping and dry water fall climbing. Ultimately, there was significant vegetation too at parts where I had to literally climb the side of the canyon at 2 parts for about half a mile since the coverage was so dense. Didn't feel too comfortable myself, since (1) there's always the mountain lions (2) any fall/slip could be rather nasty and lonely. In terms of coverage, I did a pretty good job initially along the dry river bed, but where the heavier vegetation and coverage was it was harder to see. Ultimately, not sure if Bill would have taken this route, but I think he could have ended up in a similar situation to this, albeit in a different area. Wish I had more news to report, but thought I'd post anyway. In terms of photos, I didn't take too many since I was more watching my back for any mountain lions, while scaling the canyon walls and then also trying to avoid taking a costly fall. The maps make some of these areas look a lot easier than they really are, which may have happened in Bill’s case. 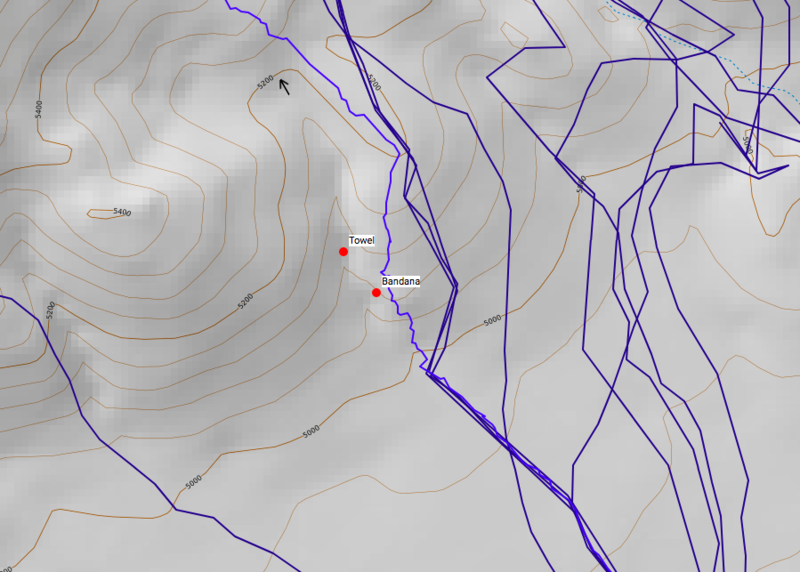 Here's the overall track of the hike... Not as much searching as I had wanted to do, but luckily made it back safely.